1:59 Emily Bridgers stormed through the Atlantic Regional to take first and qualify for the CrossFit Games. She was one of only two female athletes to finish Event 3, and she said she’s received a lot of texts from other athletes who are planning their strategy for the challenge. 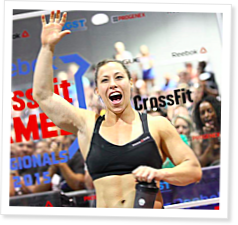 She detailed the advice she gave before explaining how she’ll prepare for the CrossFit Games in July. 14:14 Noah Ohlsen place eighth as a rookie at the 2014 Reebok CrossFit Games, and he earned a return trip by winning the Atlantic Regional. He talked about how regionals are more competitive this year with several Open regions combining and only five Games spots available. After finishing no lower 11th in any event, Ohlsen explained which of the seven regional tests were his favorites. Finally, he shared the advice he gave Mathew Fraser in advance of the East Regional. On Episode 307 of CrossFit Radio, host Justin Judkins interviewed Caution CrossFit owner Dominick Maurici. This episode was webcast on Dec. 4, 2013.